We Ride Along as Marley Natural Descends on L.A.
Atop the Hollywood Hills, overlooking the Sunset Strip and the sprawl of lights that is Los Angeles, a steady drumbeat emanates from an illuminated mansion. The Marley Natural launch party is pulsing to life. Guests filter in beneath a tree lit in blue, past a patient identification check, and up a flight of stairs. A high-ceilinged entryway opens onto a rear balcony, which affords access to a lower lawn and a stunning view of the city. The crowd, a mix of L.A. scenesters, celebrities, and reggae musicians, is abuzz with anticipation. It’s the night of Saturday, February 6. Had he lived, this would’ve been reggae legend Bob Marley’s 71st birthday. Marley died in 1981, of course, so what we’re celebrating tonight is his legacy. Or maybe a rebirth of his legacy. 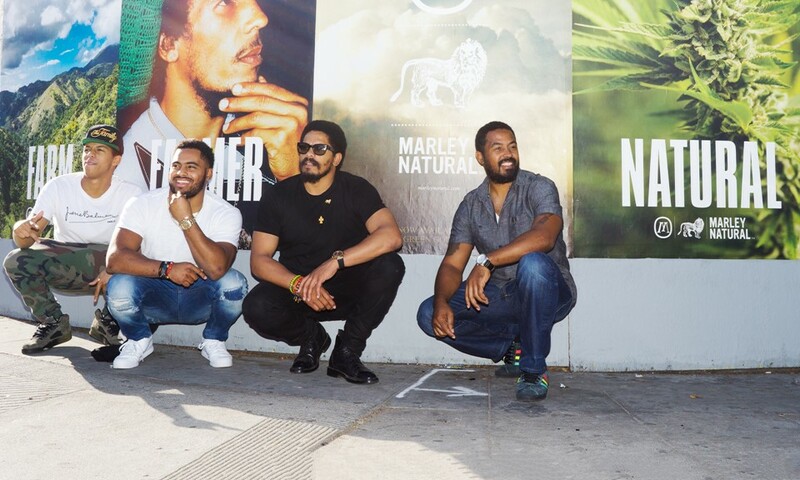 Marley Natural, a brand created through a partnership between the Marley family and Seattle-based Privateer Holdings, hopes to become one of the first global cannabis brands. (Full disclosure: Privateer is also the parent company of Leafly.) There are Marleys everywhere you look — Bob’s sons, daughters, and grandchildren — and their excitement is palpable. To Bob Marley, cannabis wasn’t cannabis — it was herb. Herb was universal, binding. It brought people together and facilitated community and focus. “Herb is the unification of mankind,” he once said. That quote now appears on Marley Natural’s website above the company’s cornerstone products: a selection of sun-grown flower, smartly packaged in glass jars with bamboo stoppers. Whether flower or concentrate, both lines offer four choices: Marley Gold, a sativa; Marley Green, a hybrid; Marley Black, an indica; and Marley Red, a high-CBD strain. At launch the strains were, respectively, Blue Mountain Fire, GSC (f.k.a Girl Scout Cookies), Sensi Star, and C3PO, but Marley Natural says those will likely vary from market to market. Eighths of flower are being offered for $50, and cartridges for $40 — pricier than most of the L.A. market but less than premium, top-shelf bud. I visit two of the three dispensaries that are hosting simultaneous Marley Natural launch events today. Each features a reggae soundtrack and a hands-on display that boasts the full line of Marley products: cannabis and vape pens, smoking accessories like a bubbler and pipes, and a line of hemp-based body care products. 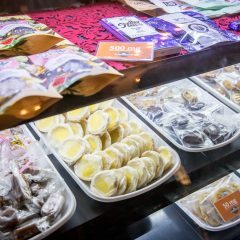 All three shops are well established in L.A.’s roiling marketplace and are known for their efforts to comply with local laws. One, Los Angeles Patients and Caregivers Group (LAPCG) in West Hollywood, claims the title of oldest operating collective in L.A. County. Another, Studio City's Buds & Roses, has a similarly sterling reputation. In what’s become a politically charged and volatile cannabis scene, Marley Natural carefully picked its friends. Outside another dispensary, Green Goddess, located not far from the Venice boardwalk, Jeannie Herer smiles through rectangular eyeglasses, her gray bangs hiding her forehead. What brings the cannabis activist and widow of the legendary Jack Herer, author of The Emperor Wears No Clothes, out in a sweater on a balmy winter afternoon? While Marley the man is widely adored for his music and message of peace, Marley the brand hasn’t escaped heat from critics. Bob Marley means a lot to people, and some have accused the company of exploiting Marley and Jamaica for profit. On the other hand, it was the Marley family that began reaching out to possible business partners through its entertainment rep, Creative Artists Agency, as the family began to see cannabis legalization coming to both the United States and Jamaica. It’s hard to imagine investors not noticing. Marley Natural spent millions to develop, manufacture, and market its products. As prohibition continues to fall away, the company has aspirations to become one of the biggest cannabis brands in the market. Today its products are in three dispensaries (out of hundreds) in Los Angeles. But with states across the country considering both medical and adult-use legalization, Marley is looking at the L.A. market as a launch pad. Perhaps the most surreal part of the night comes when medical patients trade in vouchers for their choice of either an eighth of Marley flower or one of the new vape pens. Before long, strangers are milling about, introducing themselves, trading strains, and discussing the nuances of what they’re smoking — a group behind me is negotiating how to divide their haul of flower, vape pens, and pre-rolls. The joints, filled with Jack Herer, aren’t currently being offered by Marley Natural, but it’s possible they will be soon. Privateer’s vice president of business development, Anton Albrand, tells me the Marley team is already hard at work on a second wave of products. There are, obviously, hurdles to launching a global cannabis brand on a globe where only a handful of countries, much less U.S. states, allow cannabis. To Marley, cannabis was herb. To California, it’s medicine — and partygoers are patients. (If the state’s full adult use measure passes in November, future partygoers will only have to be 21 or older.) If Marley Natural tried to throw this kind of launch in New York, where the company is based, fewer than 669 patients across the state could’ve smoked Marley’s medicine. But here, in Los Angeles, it feels like the epicenter of a burgeoning cannabis brand ecosystem. There aren’t many more prominent places to promote a new company. The night before Marley Natural’s launch, less than 100 miles away at the High Times Cannabis Cup, rapper Wiz Khalifa, who’s announced his own line of cannabis products, stutter-stepped across the stage as hundreds of patients did free dabs at vendor booths. In L.A. it feels like prohibition has already ended. As Stephen Marley, a Grammy-winning reggae artist and another of Bob’s sons, is getting ready to perform some of his father's hits, I run into another musician by the pool. Rocky Dawuni, 47, is a Grammy-nominated Ghanaian singer. There's a crowd smoking around us, but Dawuni tells me cannabis for him is sacrament. “I only use herb when I want to meditate,” he says. “Some people it’s recreational, some people it’s medicinal,” Dawuni continues, “so everybody approaches it from a different place." Dawuni says he's wary of how big business might influence cannabis culture. But the way he sees it, that's all the more reason for the Marley family and others with connections to Rastafari to get involved. "Rastas have been talking about the benefits of herb for a long time," he says. "The people who nurture the the culture and also use music as a tool to fight for the recognition of this plant shouldn't be left out of the economic boom." It's a pivotal time in history. “Commercialization, there’s going to be a lot of things that are lost in translation,” Dawuni says. “But I know that right now this herb is in the consciousness of the whole world." He sounds hopeful when he says it. And I realize it's the same hope I saw in Jeannie Herer’s eyes outside Green Goddess — a hope that the storm of prohibition may have finally broken, that the countless benefits of the plant they love so much might finally be realized. 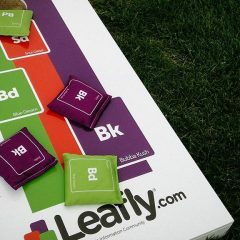 Tailgate the Leafly Way By Entering to Win Our Fall Tailgating Giveaway!